It was nice to sleep in and go for a jog this morning, both of which prepared me, mentally and physically, for the next leg of my trip around the world. 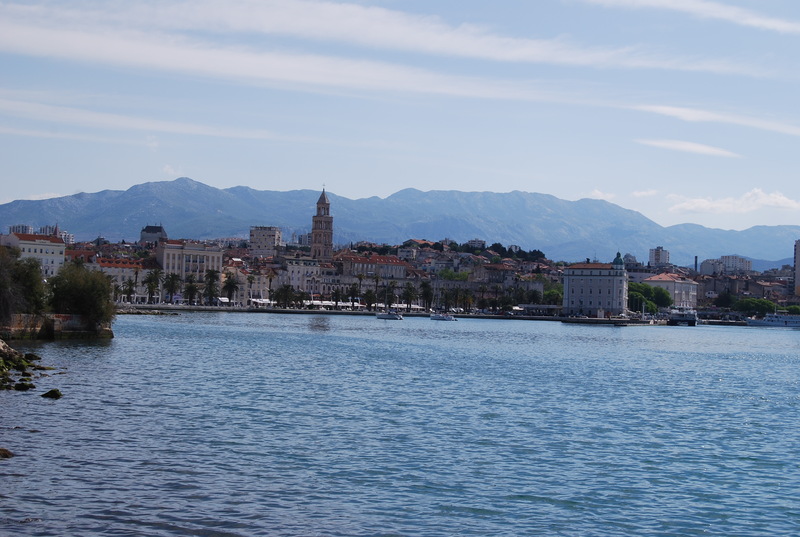 Split’s port was eerily quiet this Sunday morning, the usual movement of ferries and ships had grounded to a halt, like most of the city’s stores and restaurants. 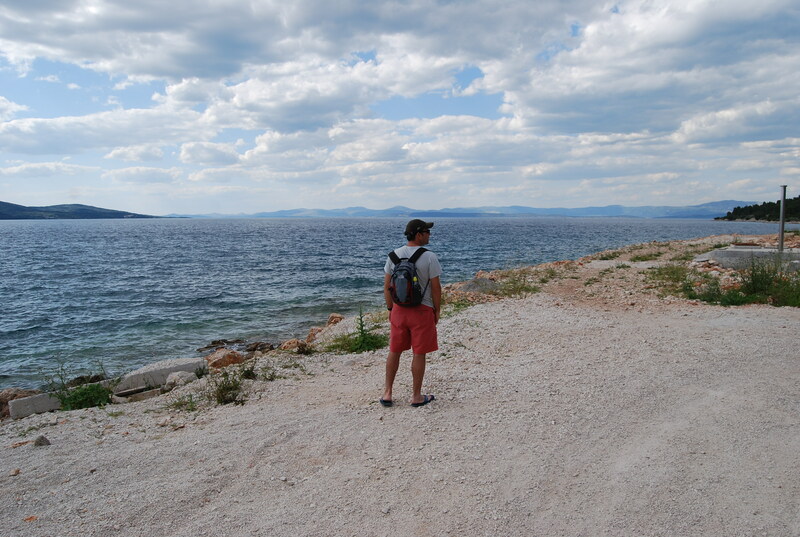 Spending the last week traveling through the Dalmatian Coast of Croatia, it hasn’t been hard to see why many have named it the next summer destination (if it’s not already). 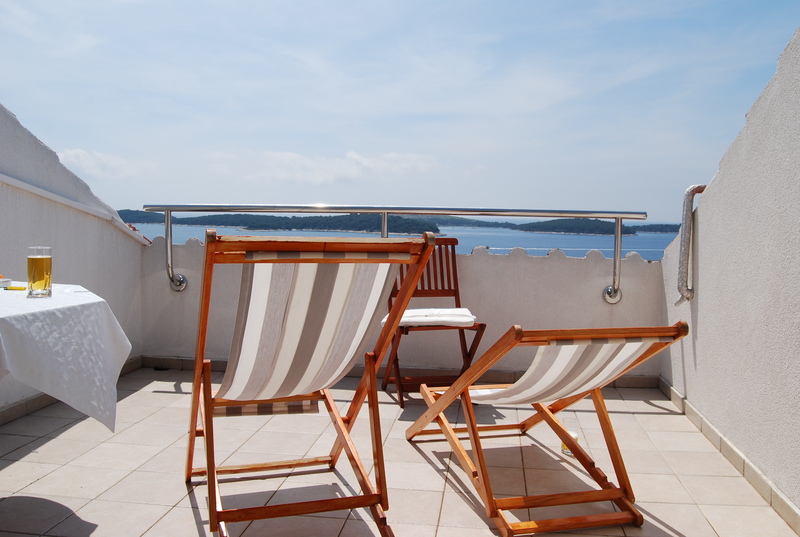 The weather is beautiful, the Croatian people friendly and welcoming and the slow development a welcome relief from the overcrowded shores of so many beach areas. I’m certain that I’ll return here. But for now, it’s another week, which means I’m off to another country. My flight departs for Greece, via Rome, in just about 90 minutes. 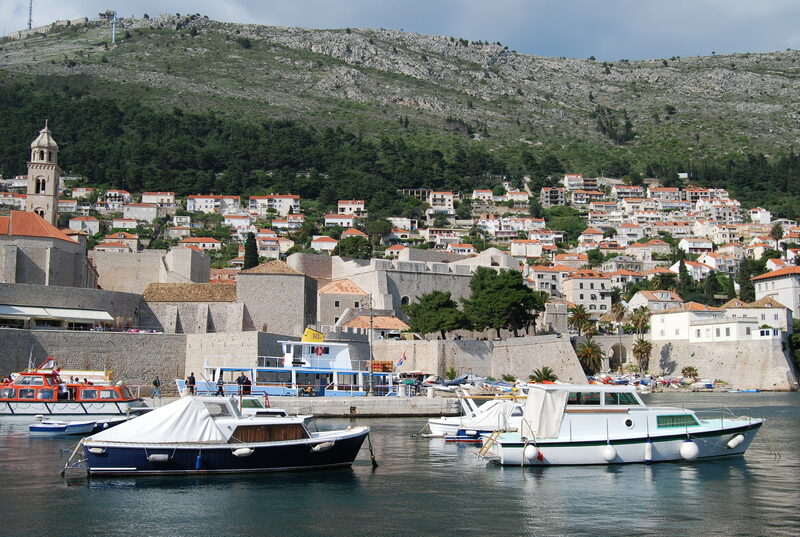 The largest island in central Dalmatia is best known for two things: its lustrous white stone that has built some of the world’s most famous landmarks, like the White House, and Zlatni Rat (Golden Horn), described by many as the most beautiful beach in this country. 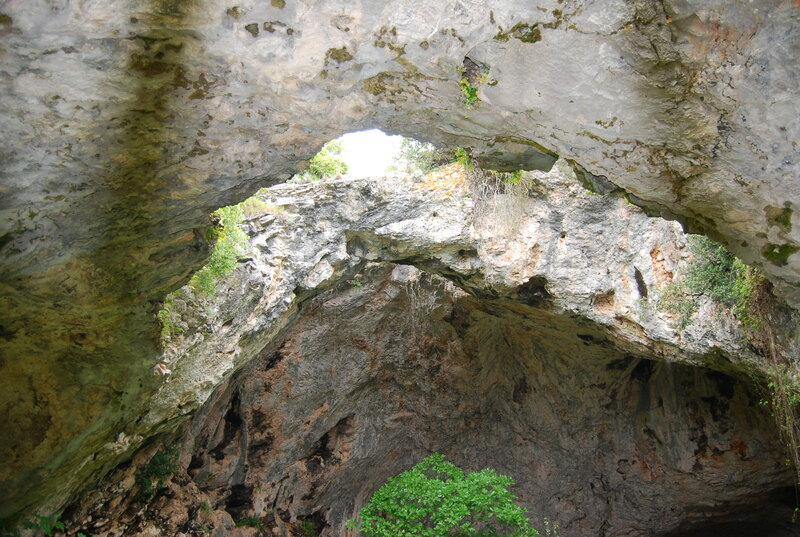 Today, after an hour’s ride from Split, we saw both. 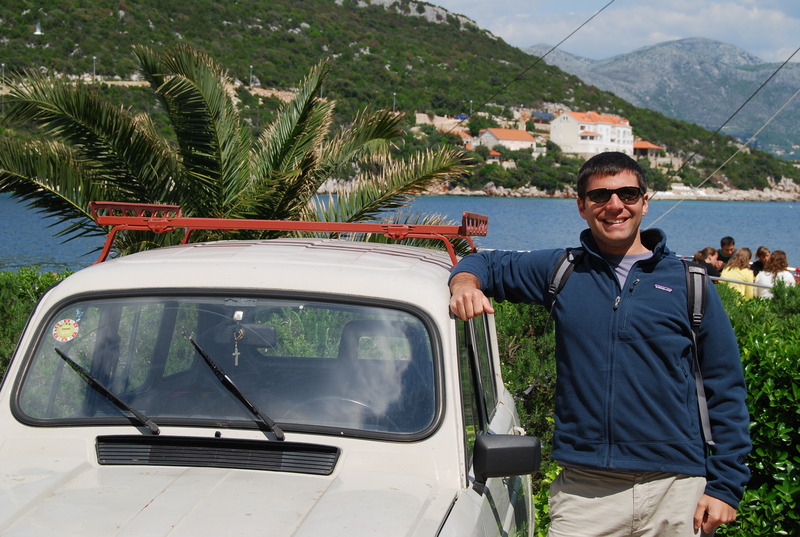 Our ferry arrived in Supetar, Brac’s main port, a little before 10 a.m. We hopped off and cut right to the matter at hand: finding the cheapest rental vehicle possible, which happened to be a Peugot 107. 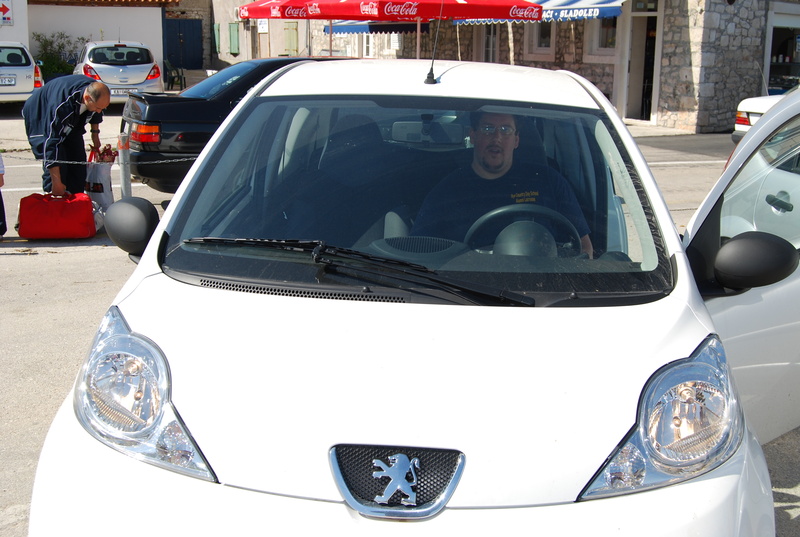 Not American-made like our Chevy Spark in Korcula, but it would do. Passing quarries and piles of stones that had been removed by hand in order to farm the land, we worked our way towards Bol, a town on the south side of the island. 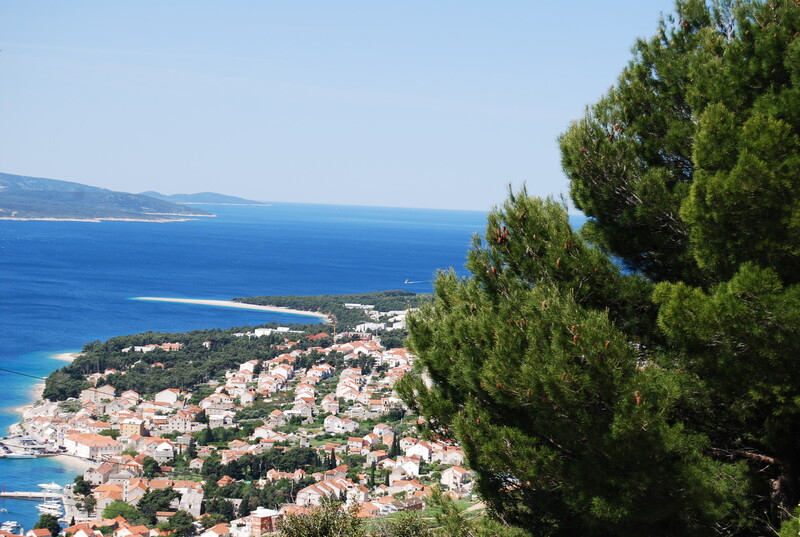 Approaching from the mountains, it wasn’t hard to spot Zlatni Rat, a smooth stone beach that juts about 1,500 feet into the sea. It has been described as a tongue, because depending on the wind and waves, the tip of the beach can change shape. 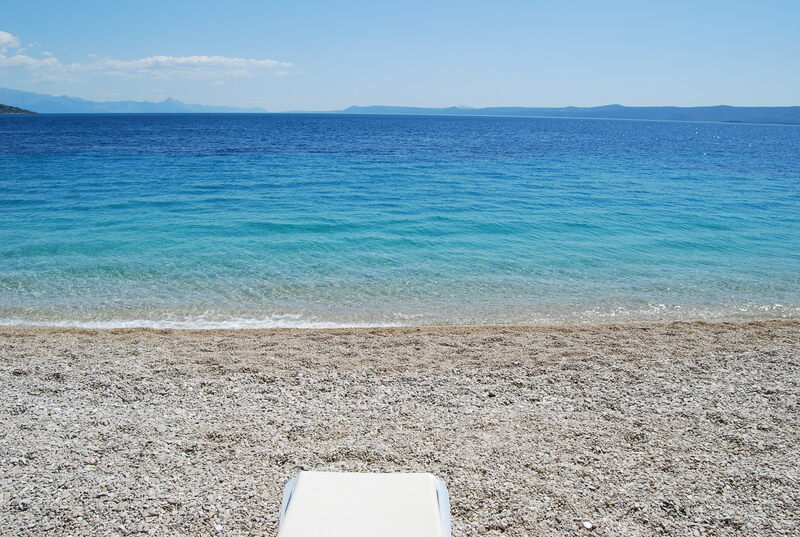 We were treated to another day of great weather (Brac gets 2,700 hours of sunshine annually), and the rocky cliffs, blue sky, crystal clear waters and pine trees separating this sliver of a beach made for a dramatic setting. 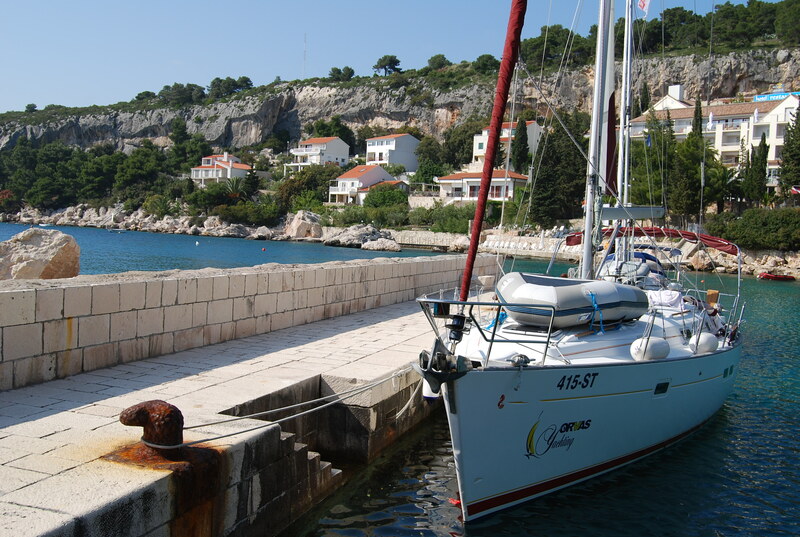 With its strong maestral wind, Bol is also the windsurfing capital of Croatia. 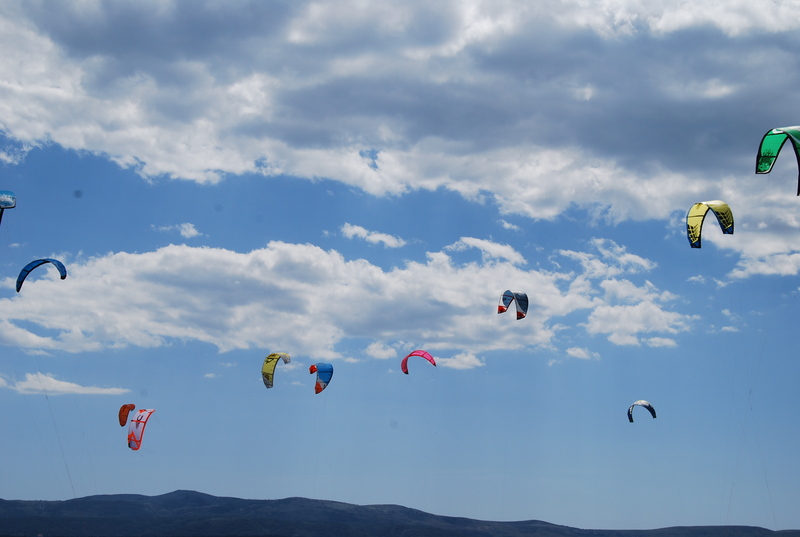 More recently, Zlatni Rat has been discovered by kitesurfers, who by early afternoon, had crowded the sky with dozens of their kites. On our way back to Supetar, we stopped in Milna, a small fishing village that was used by Emperor Diocletian en route to building his palace in Split. We had a coffee, explored the town’s harbor and then took a short hike. 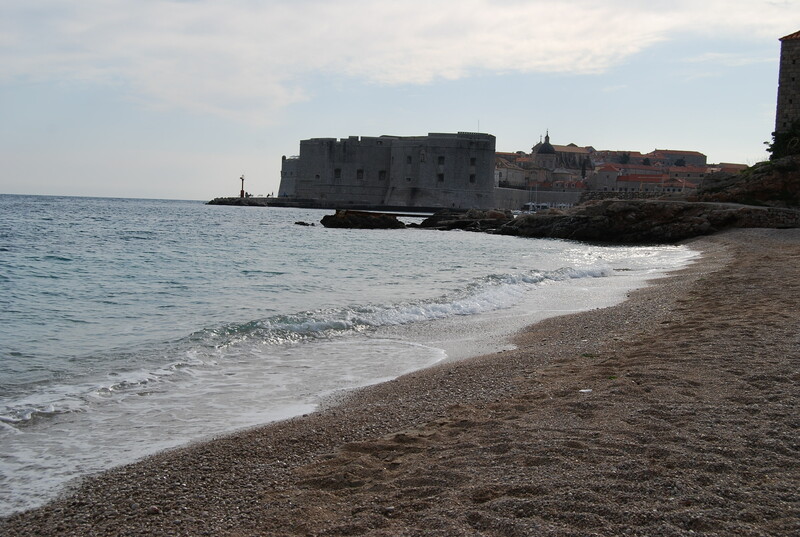 This evening, Burt returned to Dubrovnik. 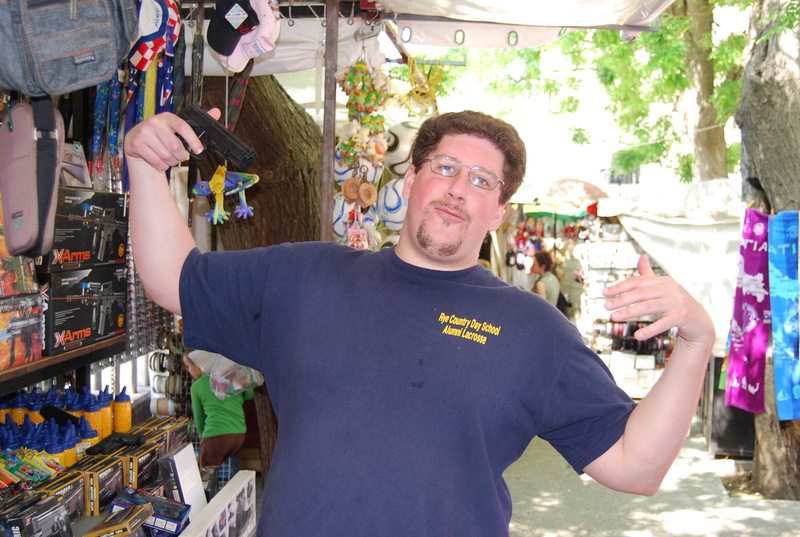 Tomorrow, he’ll be flying back to the States at about the same time that I’ll be meeting my Dad in country #4, Greece. 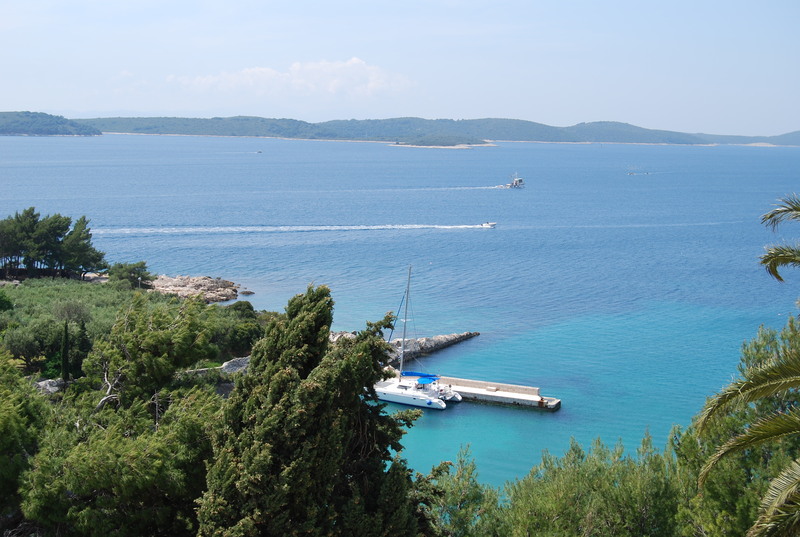 Our high speed Krilo ferry docked here from Hvar early this morning. 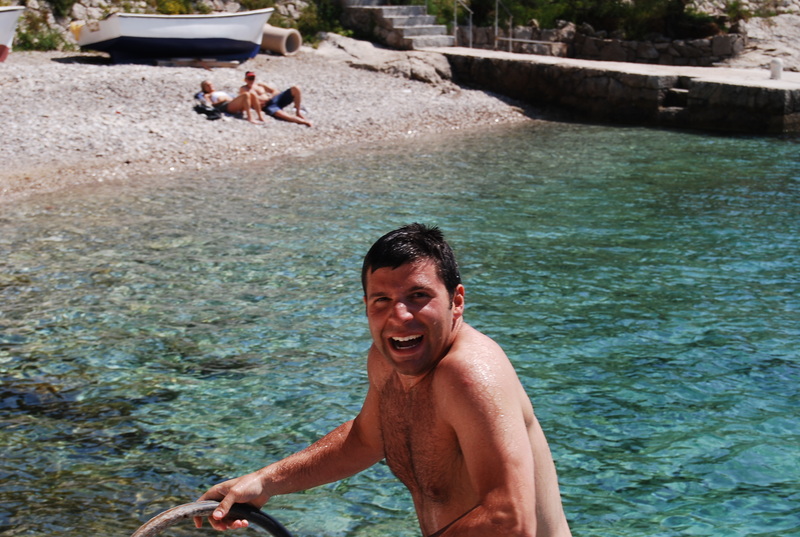 After spending over a week in the quiet outlying islands, we felt a marked change after arriving in Split, the second largest city in Croatia. There are bus-filled streets, skyscrapers overlooking the port and a general buzz that we’ve not yet encountered in this country. We’re renting 13 Stones, a centrally located 200-year old two-bedroom apartment in a residential neighborhood, situated steps from the palm tree-lined harbor promenade in a private courtyard. 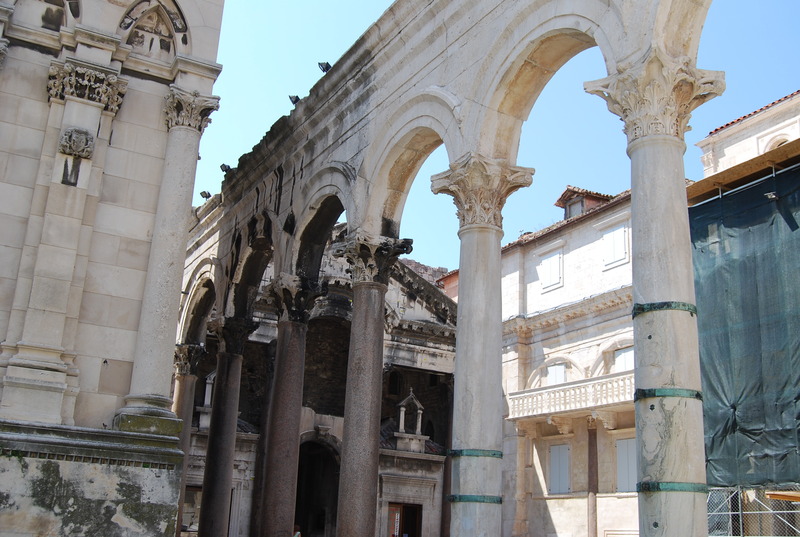 We spent most of the afternoon exploring Diocletian’s Palace, built by the Roman emperor of the same name between the years of 295 – 305. What makes these ruins all the more fascinating is that, unlike many others, they have not been relegated to a museum status seen only behind barricades. Instead, this site has become home to about 3,000 residents within the palace walls, as well as countless shops and restaurants. The entire palace is huge — it measures 215 meters from one end to the other — and was constructed with no expenses spared. 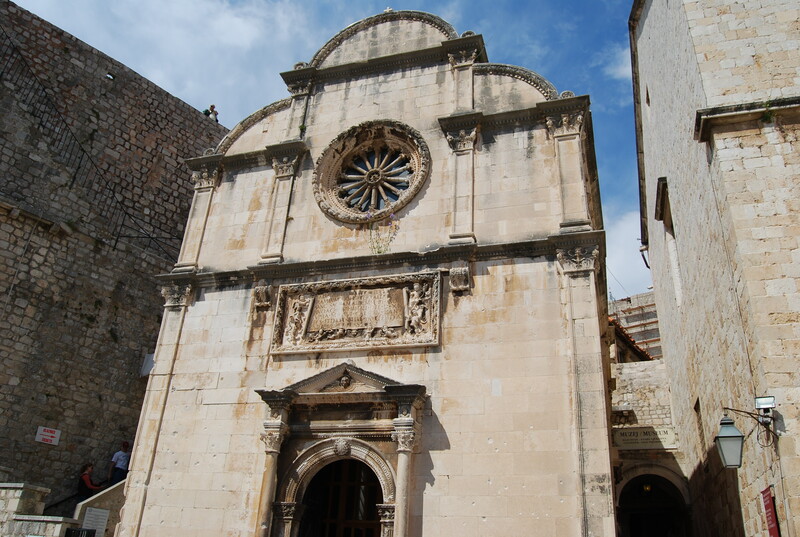 At its heart is the Cathedral of St. Dominus, which Diocletian originally built as his mausoleum. 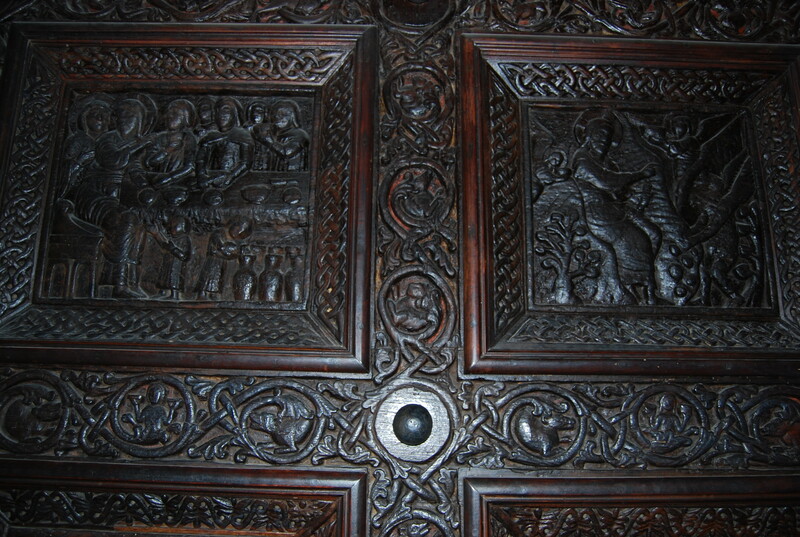 The doors were carved in the 13th century, depicting scenes from the life of Christ in 28 intricate squares. 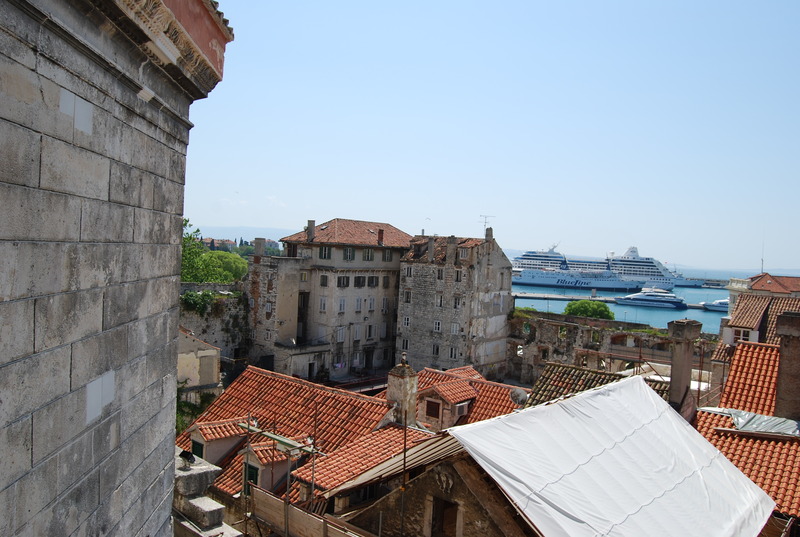 And, a climb to the top of the 60-meter bell tower offered views of Split, the Adriatic and beyond. 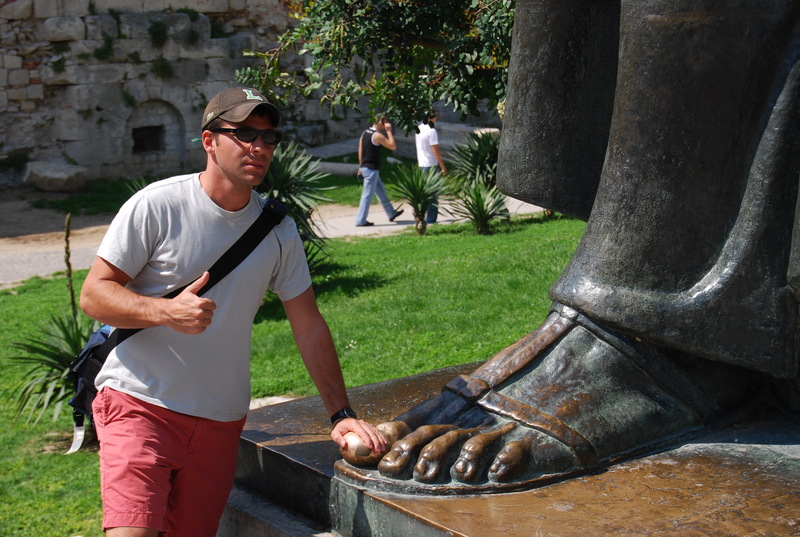 Afterwards, we walked through an open-air market, where vendors sold every item imaginable, from fruits and vegetables to soccer jerseys and pellet guns — and made sure to rub the left big toe of the statue of Gregorius of Nin, as doing so is supposed to bring good luck. 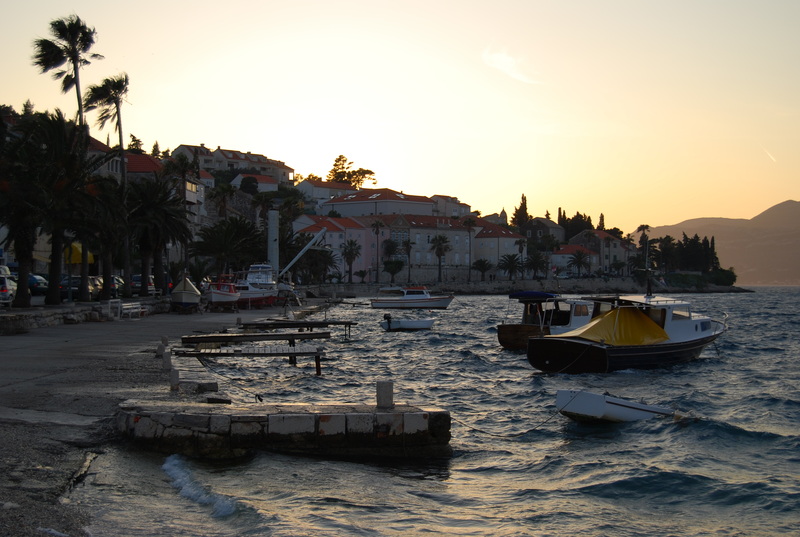 Tomorrow, we head to Brac, the largest island in central Dalmatia. We still haven’t figured out what holiday it was today in Croatia — the banks, markets and some sights were closed — although it didn’t make much of a difference. After a great seafood dinner last night, we slept in late and then headed into Hvar Town, famous for its outlying fields of lavender, for some brunch. It was, unsurprisingly, another beautiful day here. 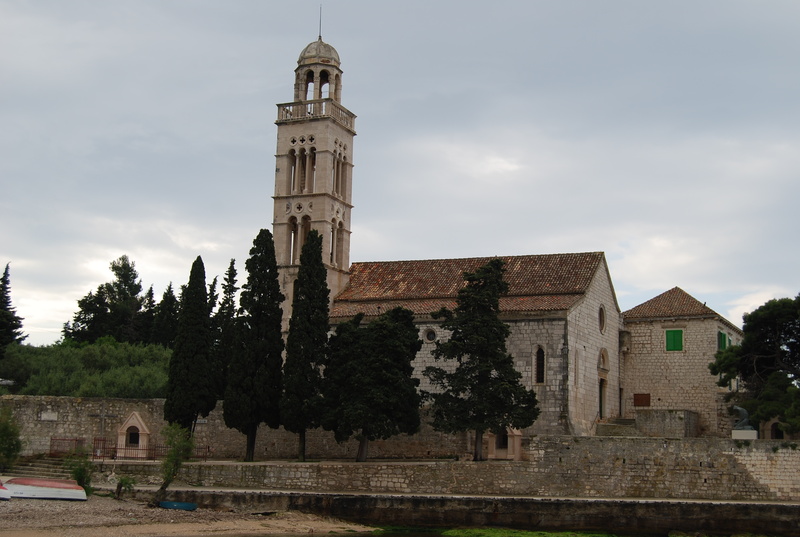 We walked to the 15th century Franciscan monastery, which overlooks a shady cove of the Adriatic and whose bell tower was built by a well-known family of stone masons from our previous destination, Korcula. With the weather near perfect, we changed into our bathing suits and made our way to a sheltered cove just a couple minutes from our apartment. The pier made for a great place to put down a towel, get some sun and relax away the afternoon. Our ferry leaves for our final destination in Dalmatia, Split, tomorrow at 7:30 a.m.
We got up before dawn this morning — likely while many back home were just hitting the sack — for our high-speed Krilo ferry. 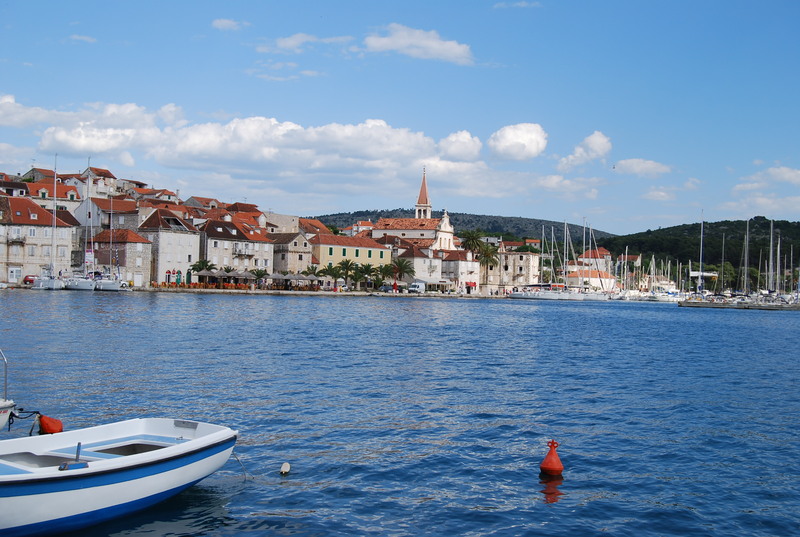 About an hour later, after some initial fog had burned off, we arrived in Hvar, which fulfilled its sunny skies promise. As cafes set up outdoor seating and fishermen prepared their boats, we walked around this 13th century town that recently has been transformed into a swanky destination for international jetsetters. We’re staying in a spacious top-floor two-bedroom at Apartments Milicic, about a 10-minute walk from town along a seaside promenade. 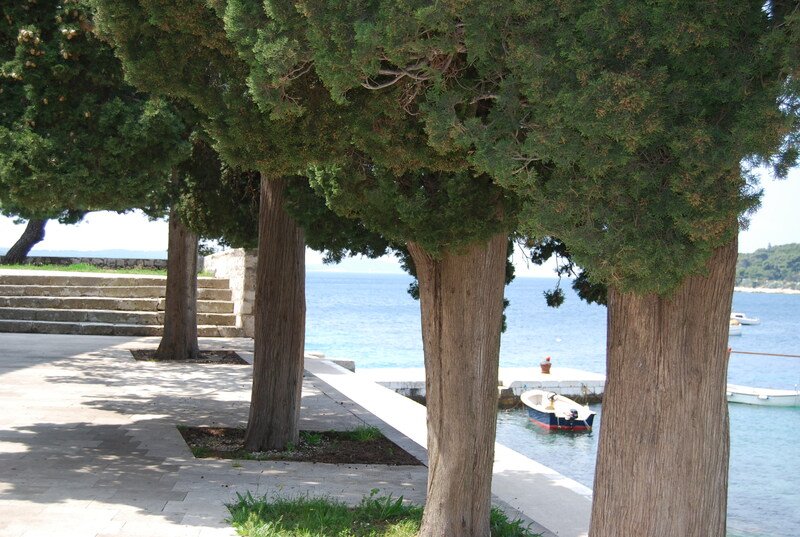 Its patio offered a great spot to lounge, take in the lush scenery of a nearby cove and recover from the early start. Afterwards, we headed into town, which is so small that its streets don’t even have names. We had a cup of coffee and a pastry at a café on the marble-paved main square, the Trg Sveti Stjepana, which, at 4,500 sq meters, is one of the largest old squares in Dalmatia. More remarkably, we learned, it was formed by filling in an inlet that once stretched into the bay. Feeling particularly motivated, we next hiked to the top of the Fortress Spanjol citadel, built to defend Hvar from the Turks. 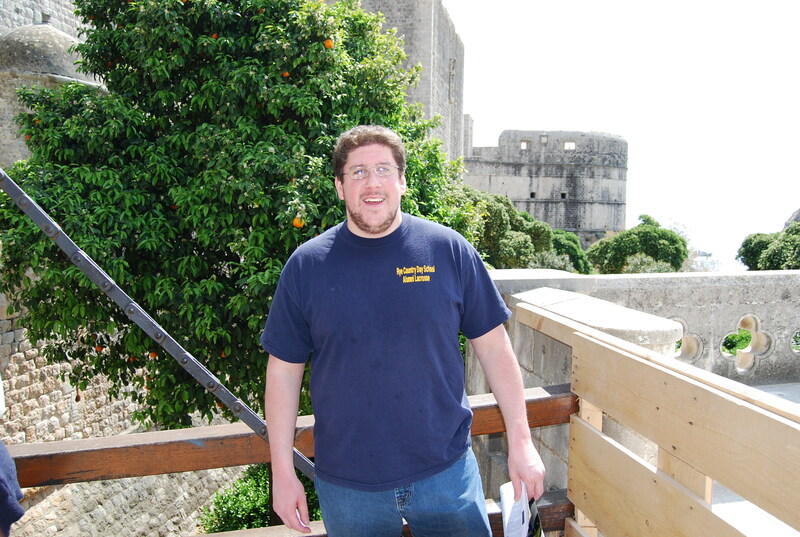 It offered a great panorama of the harbor far below. 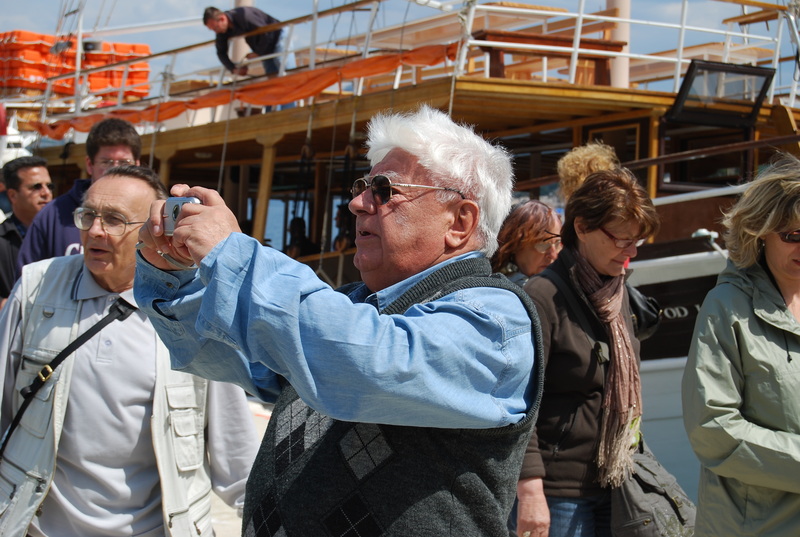 Back in town, and with temperatures creeping up, the crowds of yachts and sailboats began to fill the small harbor. We spent the rest of the afternoon lounging down at the rock and pebble beach below our apartment. 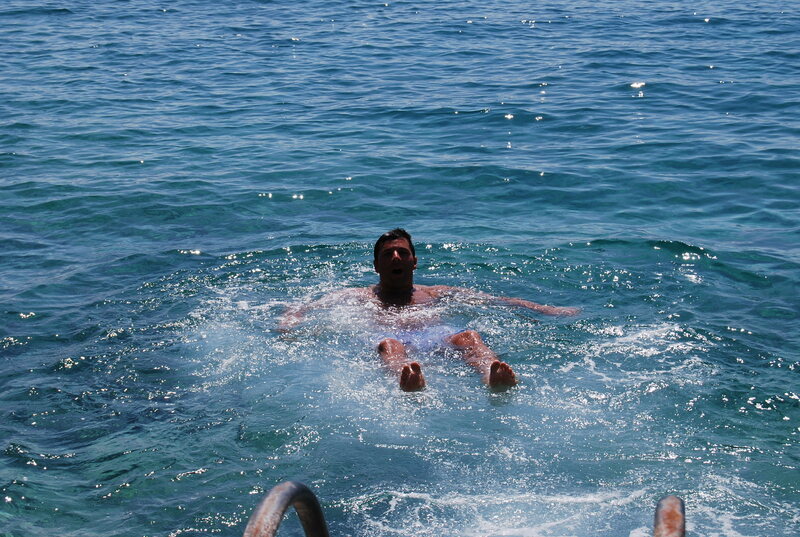 Soon enough, the chilly Adriatic was calling our names and we took a dip. At a refreshing 16 degrees celsius, we didn’t last very long though. Tonight, we don the trendy gear and hit the town. It’s likely we’ll have a late start tomorrow morning. Local legend is that Marco Polo was born in this town in 1254. Because of this, it seemed appropriate enough that today we set out to do our own exploring of an unfamiliar land. 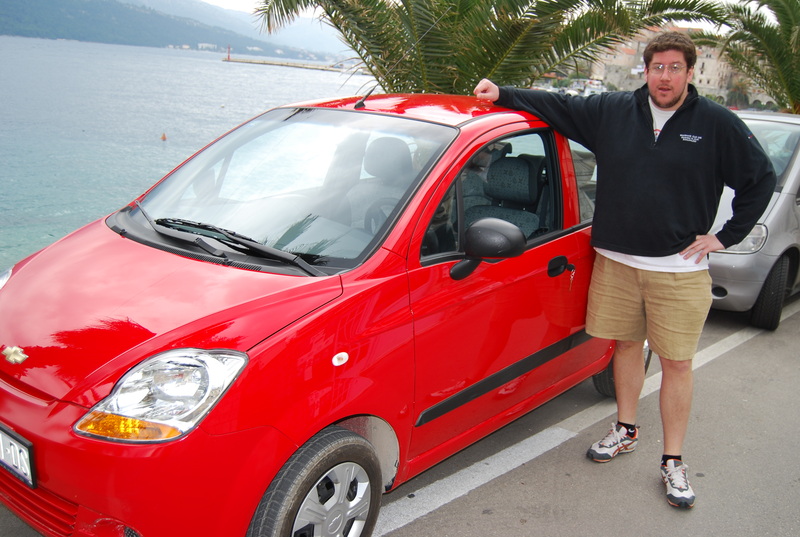 Our mode of transportation was a bit different than Polo’s grand vessels — instead, we secured an amazing, American-made, Chevrolet Spark. 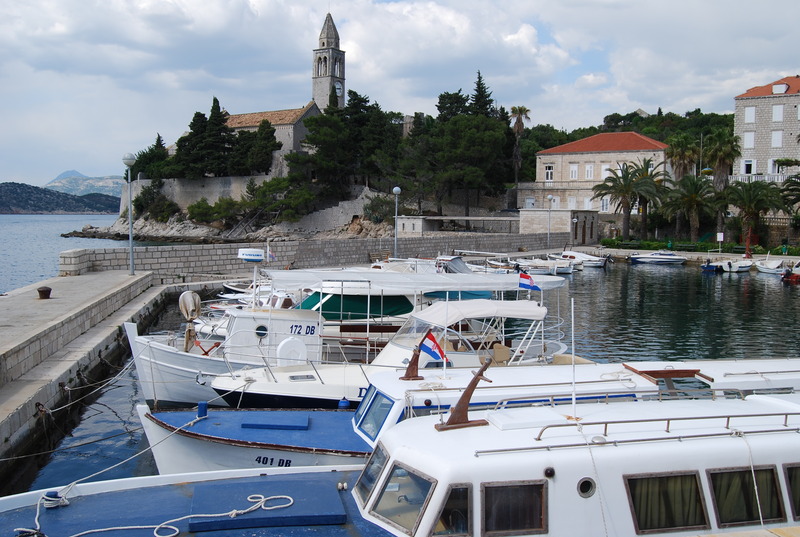 With Burt at the wheel, and me as his first-mate (helping to direct us through the island’s maze of six streets and about as many FM radio stations) we set out to see Korcula with no real plan. 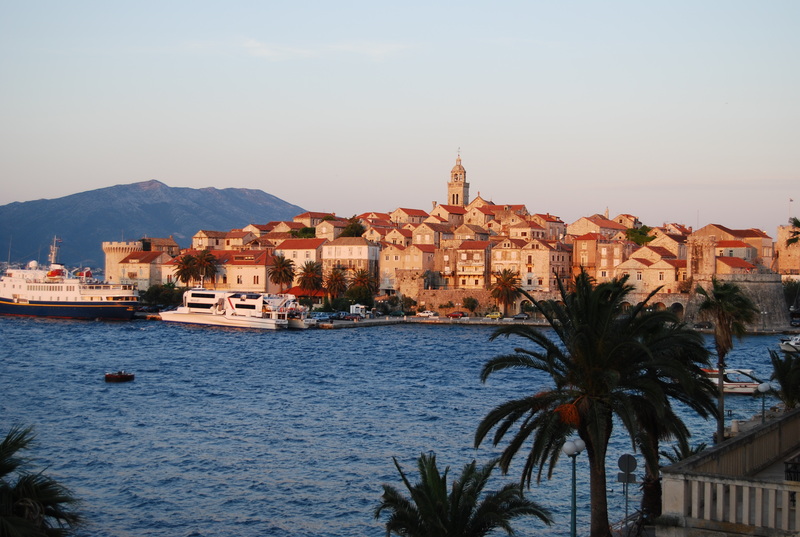 Under partly cloudy skies, we first visited Korcula Town, the most populous city with about 3,000 residents. 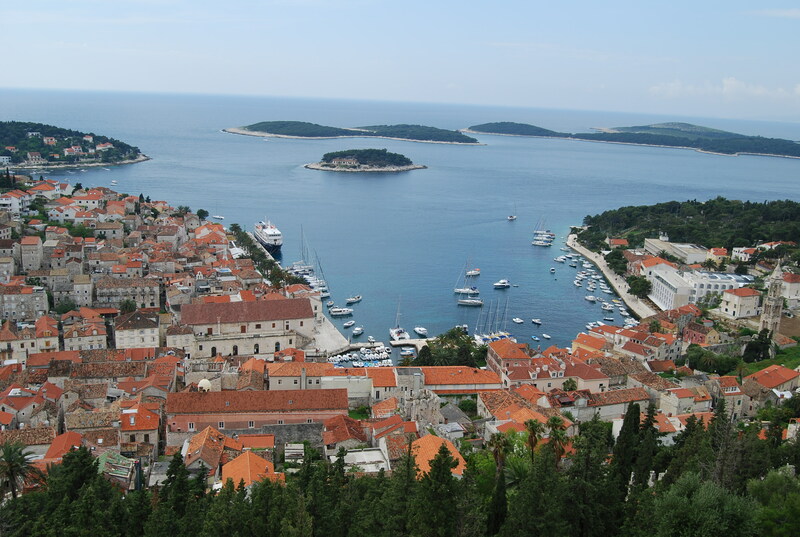 It’s a peaceful medieval Dalmatian town, with grey-stone houses nestled along the crystal clear waters of the Adriatic Sea. 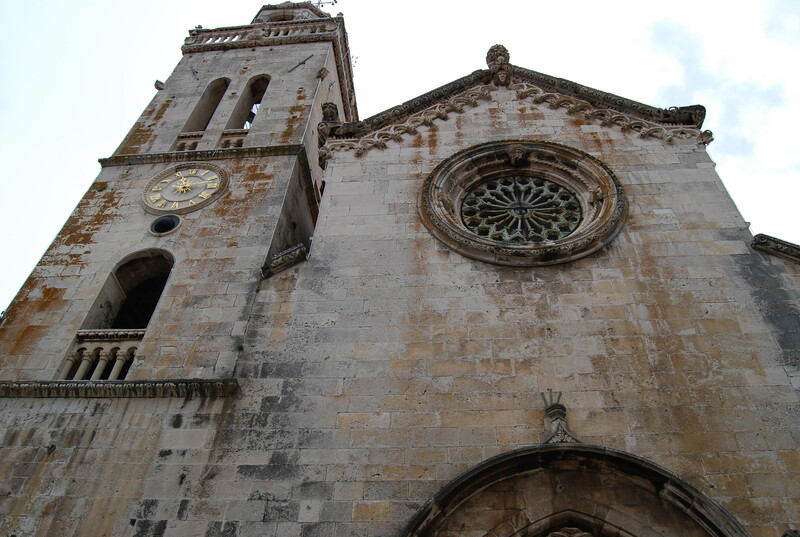 The highlight is St. Mark’s Cathedral, built of Korcula limestone in the 15th century by Italian and local artisans. The windy roads along the coast brought us back east, through Blato, Prizba, Brna and Smokvica. 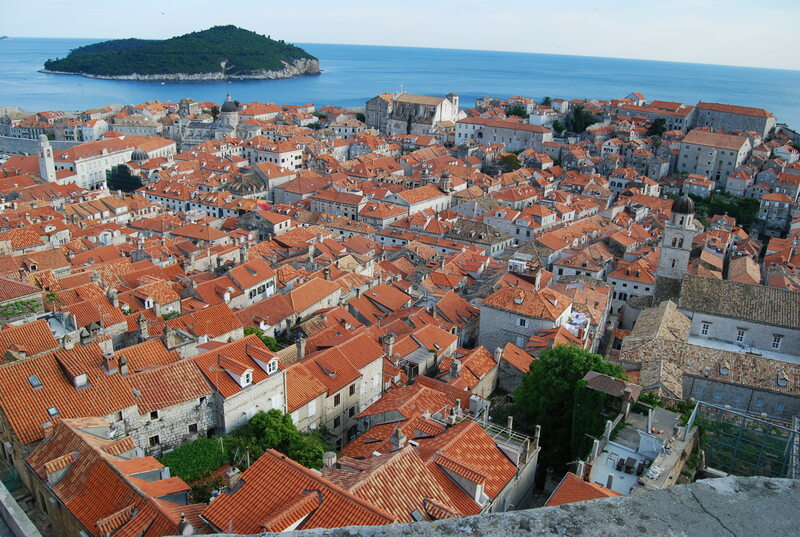 These are small towns, tucked into hillsides and built in the traditional Dalmatia style, with stone walls and orange tile roofs. We pulled over in Cara, best known for Croatian wine. The friendly proprietor at Bona – Kapjica invited us into his home to try some of the wine and grappa that his family has been producing for generations. 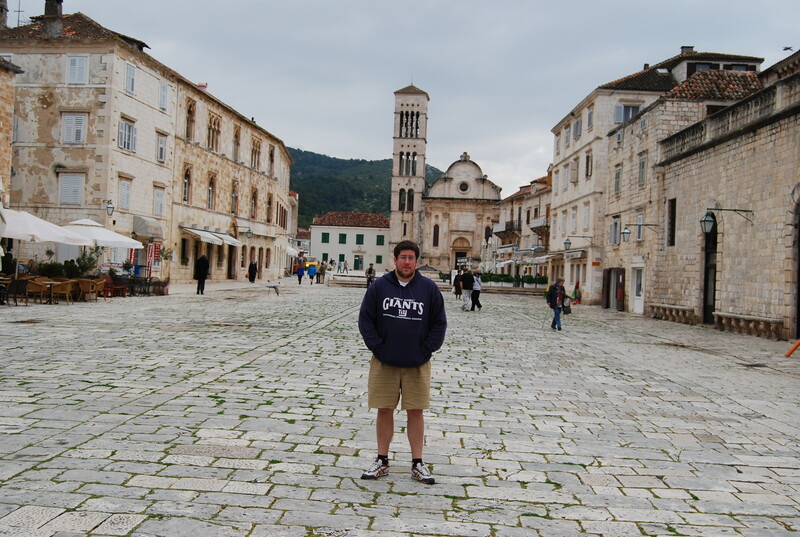 Tired from the day’s driving and with the skies opening to rain, we made our way back to Korcula Town, where we learned first-hand how expensive gas in Europe really is. 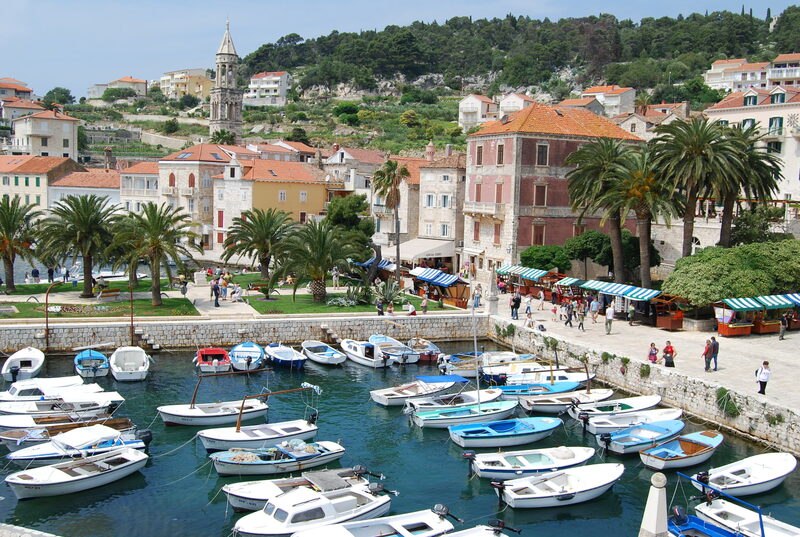 We leave at 6 a.m. tomorrow for Hvar — the sunniest city in all of Croatia with 2,724 hours of sunshine each year. Let’s hope that includes our next 48 hours there. 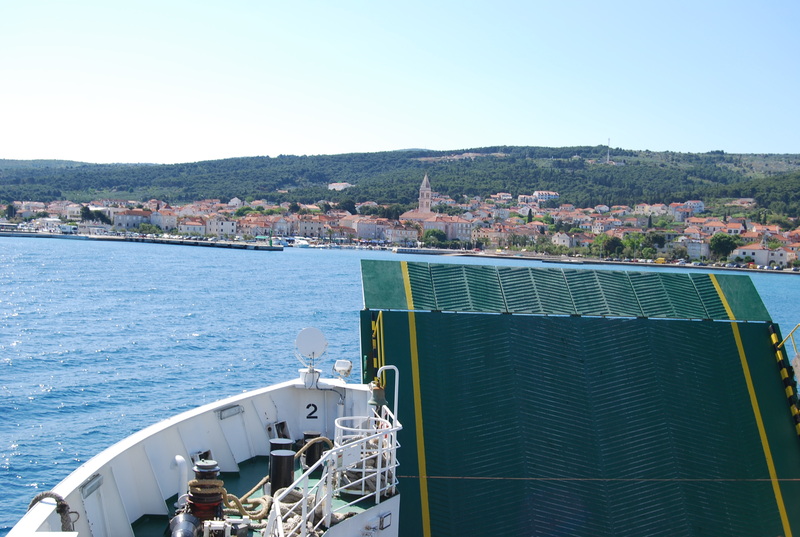 We arrived here after a 3-hour bus and 20-minute ride aboard the Sveti Krsevan Rijeka ferry. 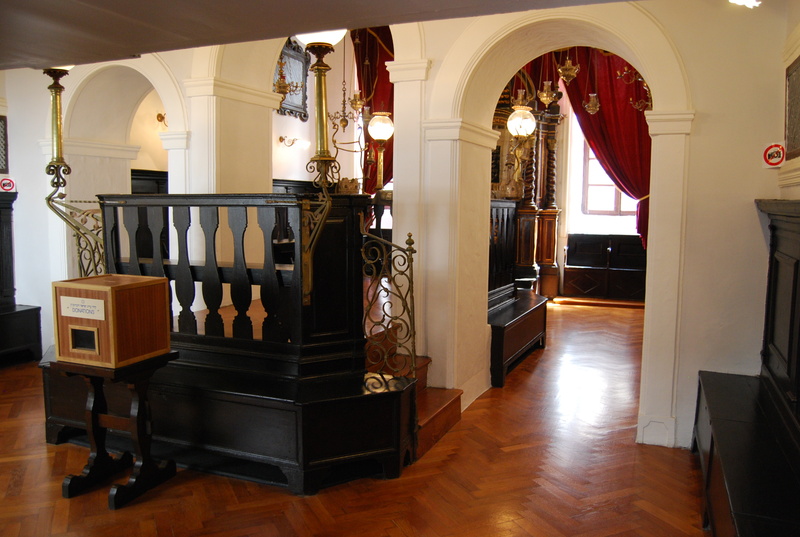 Our accommodation for the next two nights is at Apartments Depolo, in the residential neighborhood close to the Old Town of Sveti Nikola. 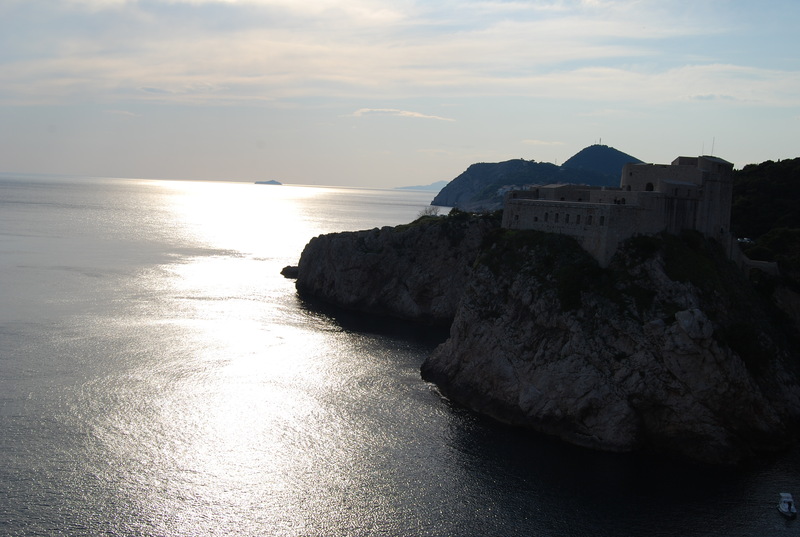 It’s a really nice place (Japan’s ambassador to Croatia is in the room next door), and, as in Dubrovnik, the patio offers some great sunset views. 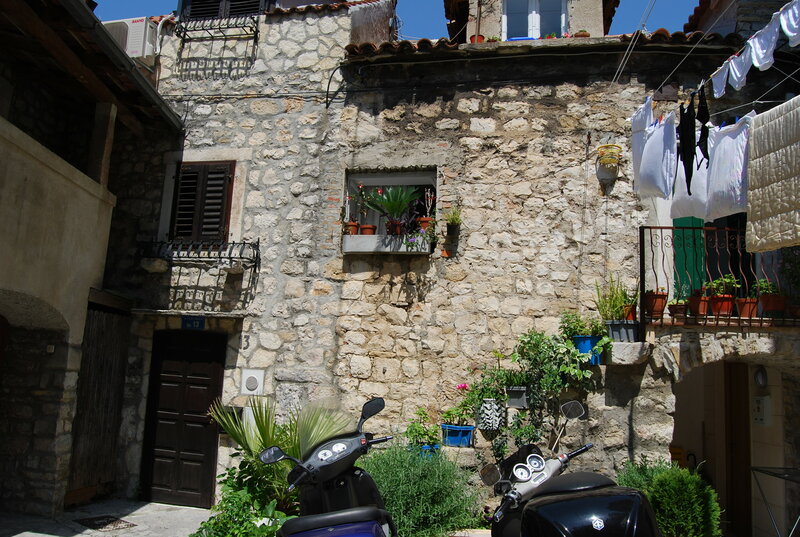 Our initial impression of Korcula: it’s windy. In fact, this town’s streets were cleverly designed — those that run west are straight in order to open the city to the maestral (a strong, refreshing wind) while those that run east are partly curved to minimize the force of the bura (a cold wind from the northeast). 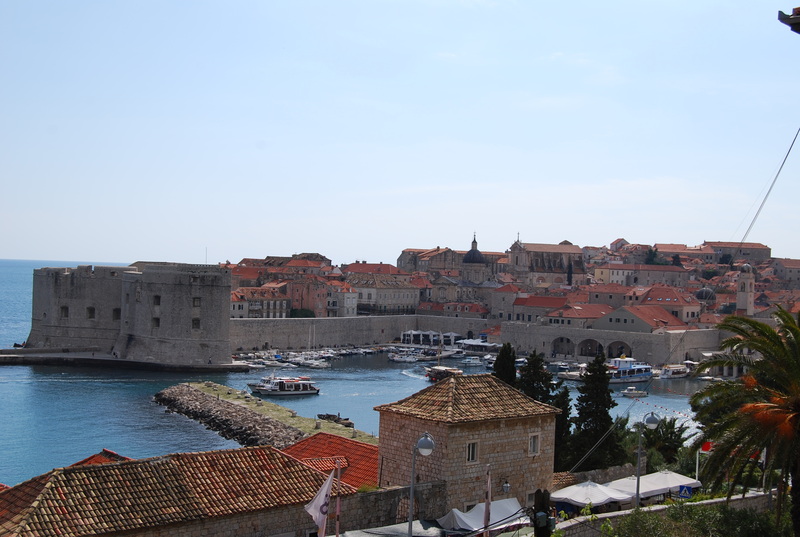 Earlier today, we visited two last sights in Dubrovnik. 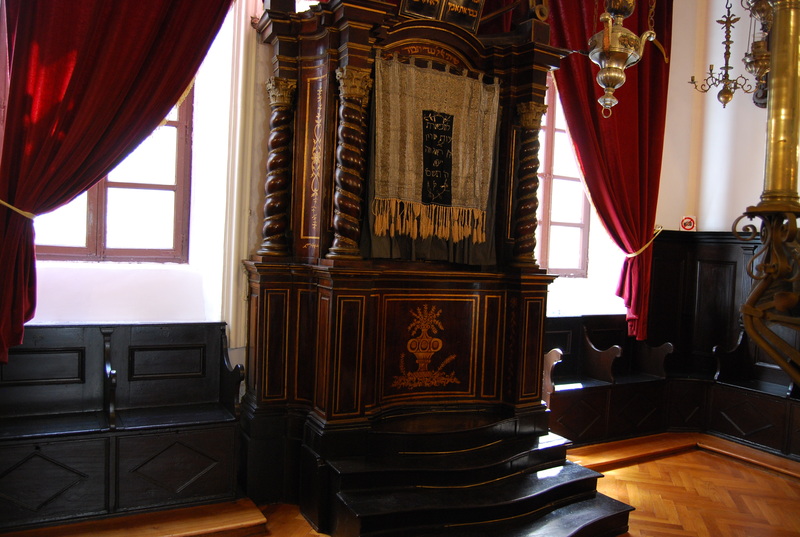 Our first stop was the city’s 15th century synagogue, which is the oldest Sephardic and second-oldest synagogue in all of Europe. Afterwards, we walked to the top of the Lovrjernac Fort, which protected the western end of the city and offered some last views of the walls. We’re off to get dinner at a local restaurant that specializes in Croatian food. 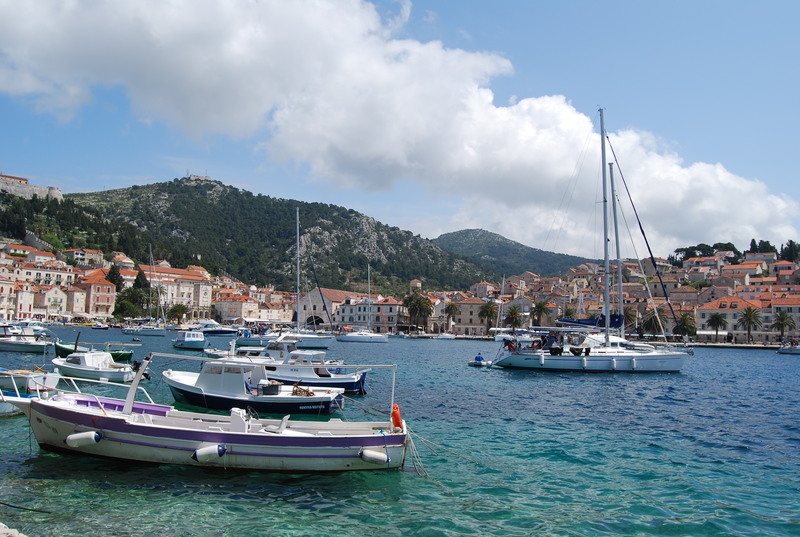 Tomorrow, we rent a car to explore the island of Korcula. After Burt arrived this morning (with Rangers playoff beard and no ATM card) via Dublin, we set out to see and experience this small but beautiful coastal city. Everyone say hi to Burt! Luckily, there was only one cruise ship in port today (once June rolls around, that number can jump to 4-5) so there weren’t too many tourist hordes to get trampled by. 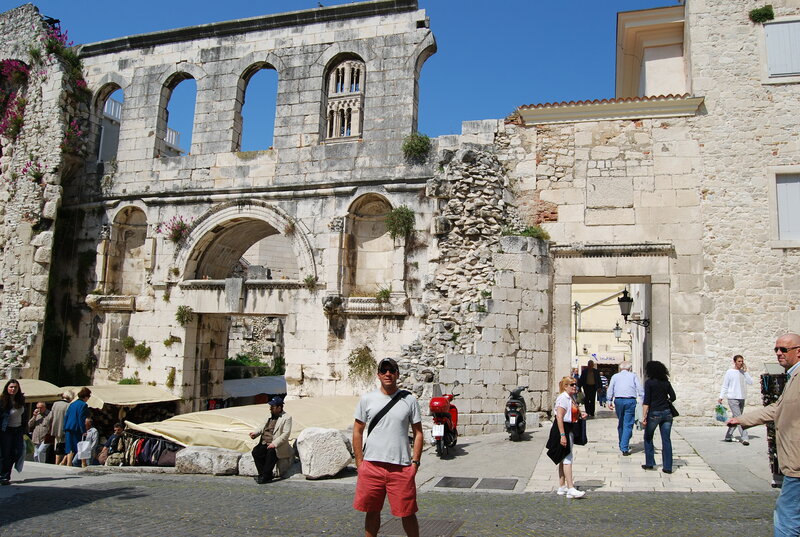 We started at the Old Town’s Pile Gate, built in 1537. Originally, we learned, the gate’s drawbridge was closed every night — and the only key handed to the prince. 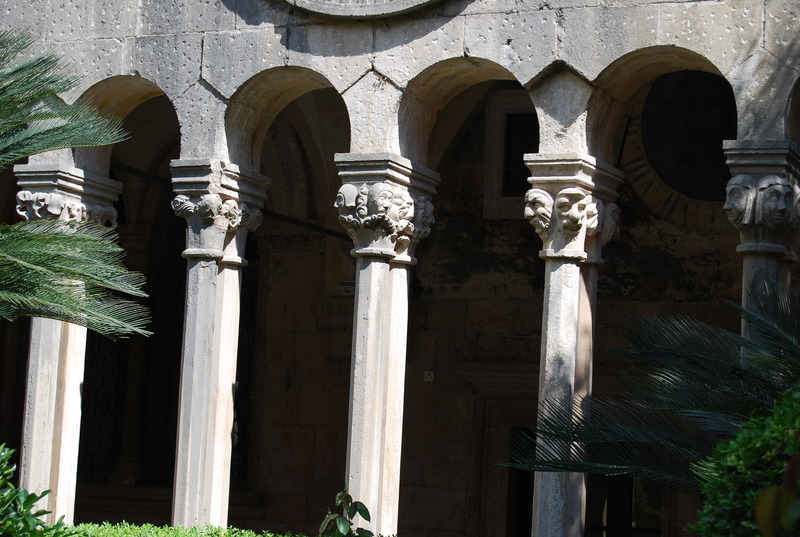 Our next stop was the Franciscan Monastery — inside is the mid-14th-century cloister with what are said to be some of the most beautiful Romanesque structures in Dalmatia. We again walked the main drag (Placa), stopping for some gelato and people watching. 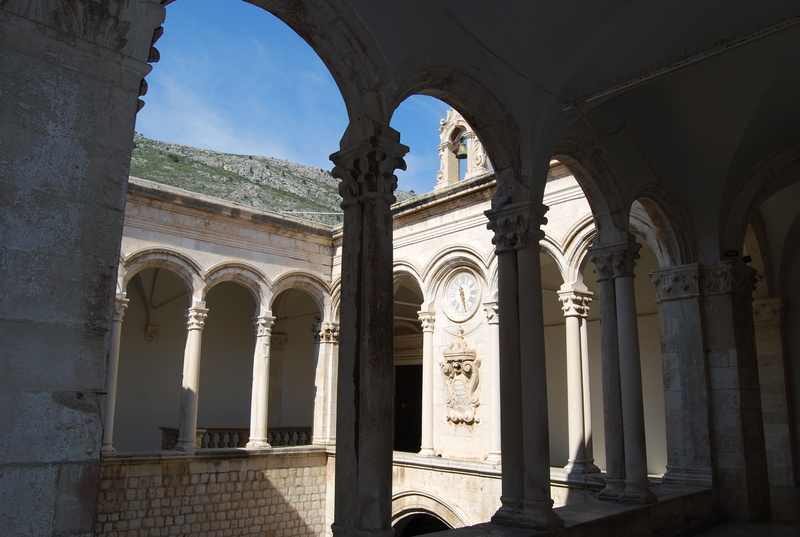 Afterwards, we visited the Sponza Palace (which now houses one-thousand years of archives) and the Rector’s Palace, which was home to Dubrovnik’s elected governor — who was not permitted to leave the residence during his one-month term. 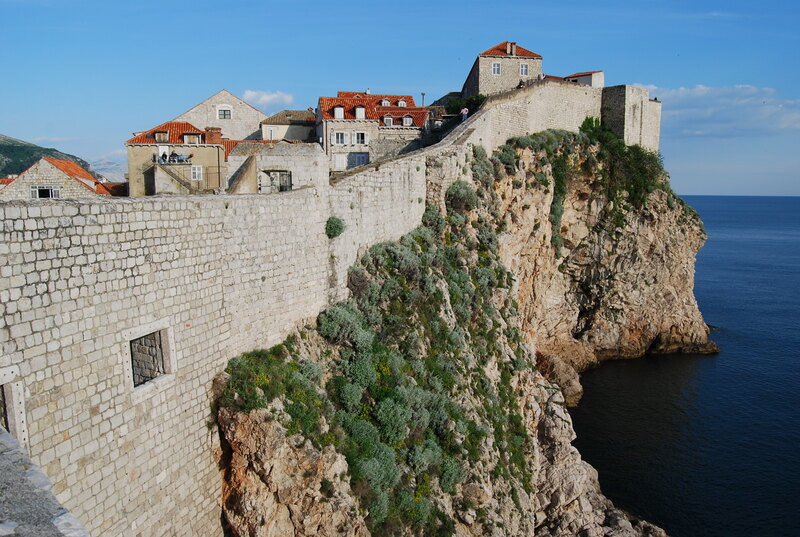 As the sun set on the horizon, we walked the famous city walls, built between the 13th and 16th centuries. The threat of attack from the Turks was very real during this time – so much so that the walls are up to 6 meters thick and 25 meters high. 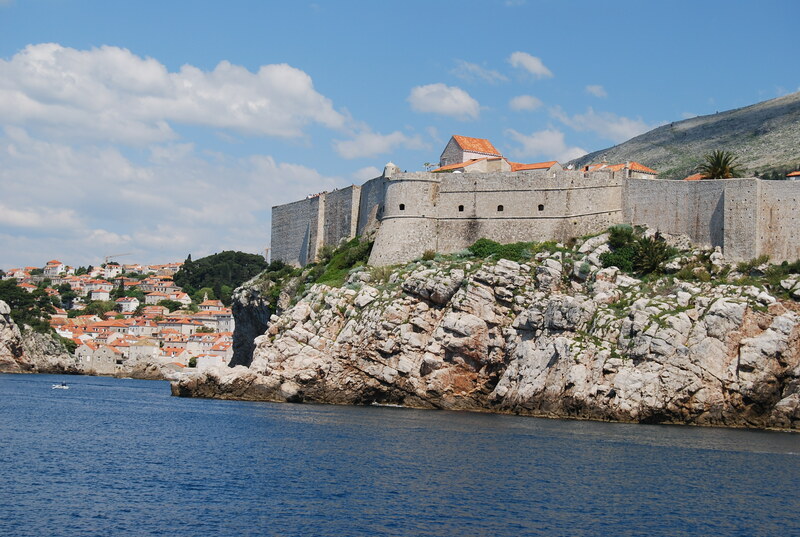 They were protected by 15 square forts, like the Minceta Tower and Lovrjenac Fort, that offered commanding views up the mountains and out to sea. 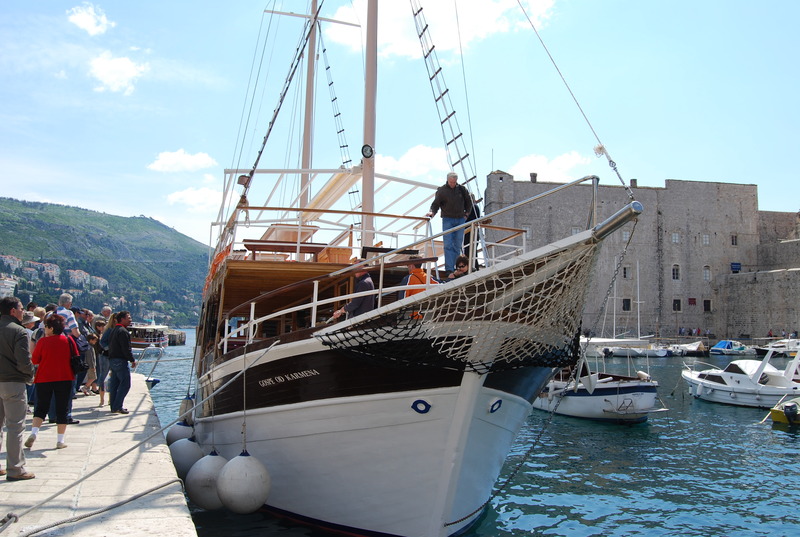 Tomorrow, we board the Adriana Cavtat to explore the Elafiti Islands of Kolocep, Lopud and Sipan. My third flight this morning brought me to my third country on my trip around the world. 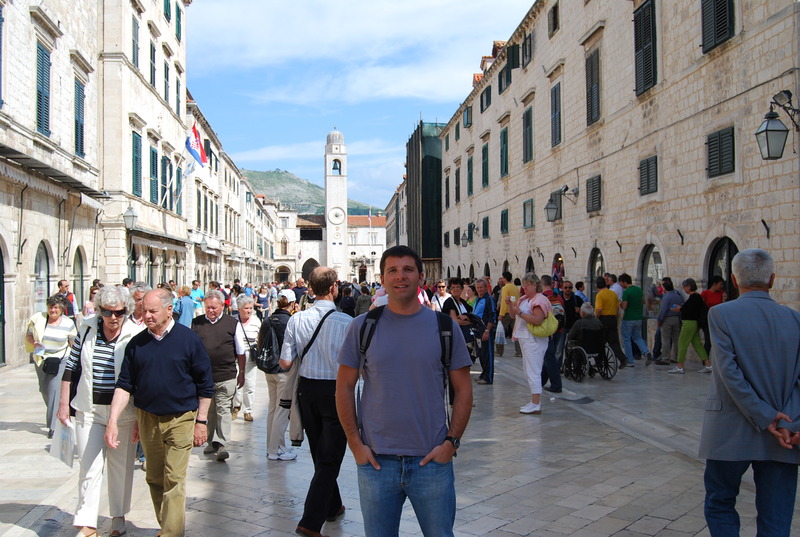 Wheels were up from Barcelona on Iberia flight 1312 at 12:26 p.m. and we touched down in Dubrovnik about 2 hours later. 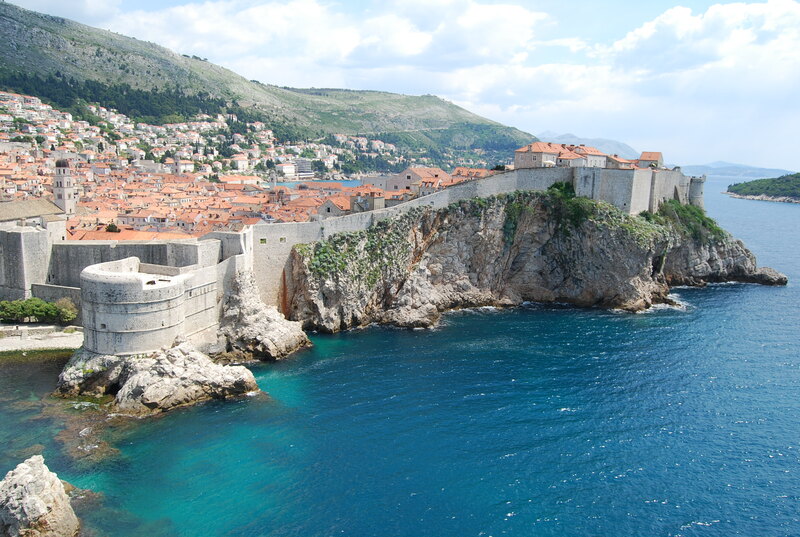 Dubrovnik is a town of about 50,000 on the southern Dalmatian Coast that has a history dating back to the 7th century. My short transfer from the airport brought me to the wonderfully located apartment that I’ll be staying at for the next three nights. 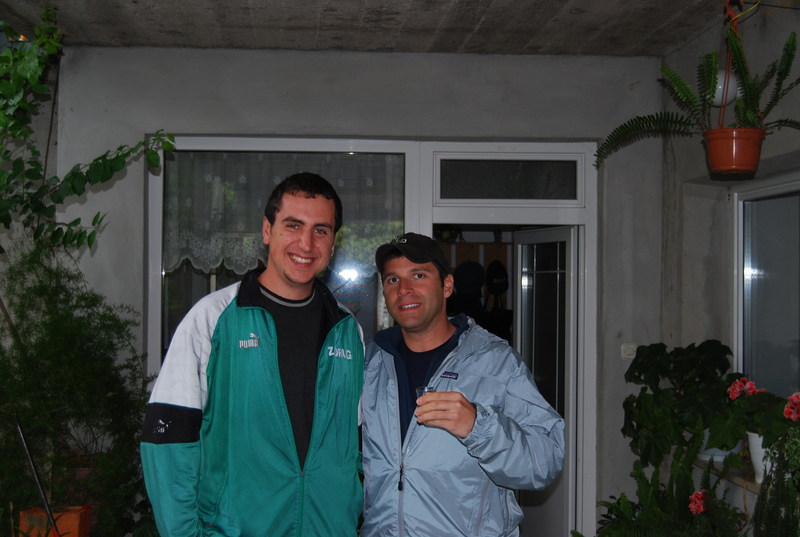 The owner, Ivan Kalas, showed me around the orange groves and gardens of his home before explaining that the roof top patio of my apartment was completely demolished by a mortar during the shelling of this city in 1991. It has since been entirely rebuilt and, today, might offer one of the best views of the walled Old Town. But, even in a place as special as this, it’s assuring to know you’re never more than a couple of steps from your favorite designer’s boutique — here, Lacoste on the main marble-paved drag called the Strada. 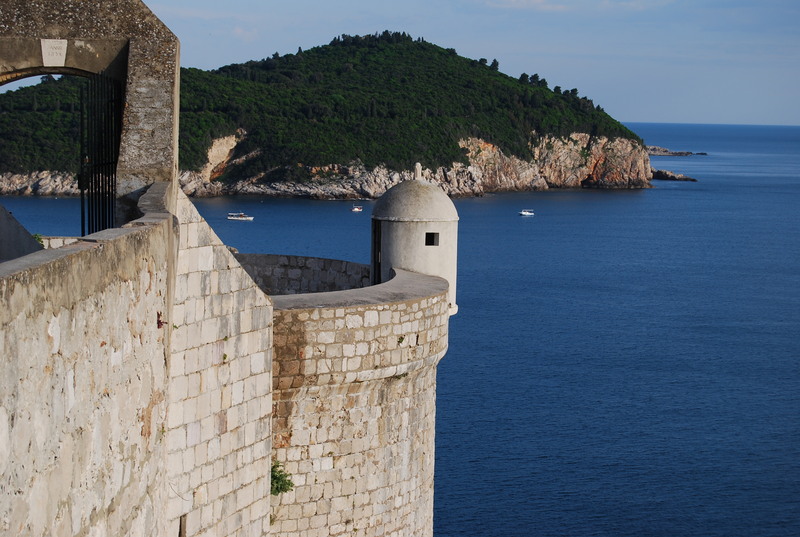 The beaches of Dubrovnik have made it the summer destination for Europe’s jet-setters. Somewhat pebbly, they’re typical of the Mediterranean, although the views make them all the more spectacular. It’s been a long day of traveling. 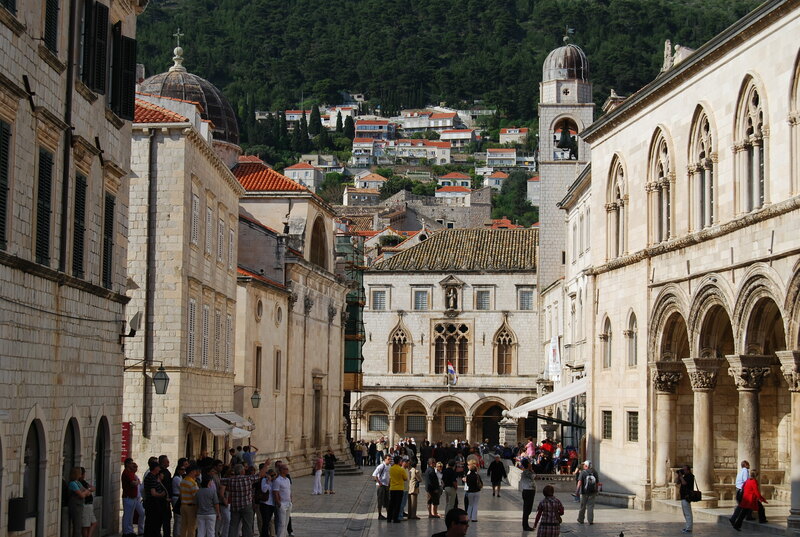 Burt arrives here tomorrow and then we’ll spend the afternoon exploring all that Dubrovnik has to offer.